Sometimes it pays to dust off old papers for new ideas. Earlier this year, TD scientist Anna Grassellino began researching past successes and failures of accelerator cavities made of bulk-diffused niobium-nitride. Scientists reported less than stellar results in their tests in the 1990s and, in the years since, appeared to have mostly abandoned the material as a possibility for superconducting cavities. But Grassellino believed trying niobium nitride would be worth another go-round. Her effort paid off. This month, Grassellino reported a world-record measurement on a 1.3-gigahertz, single-cell niobium cavity heat-treated in a nitrogen-rich atmosphere. The cavity achieved a quality factor of 7.5 x 1010 at 2 Kelvin and at a 20 megavolt-per-meter peak surface electric field. The measurement is almost twice that of the next-highest reported quality factor of any accelerator cavity. It bodes well for superconducting radio-frequency research. A cavity’s quality factor, Q for short, is a measure of how efficiently energy is stored in the cavity. The energy stored in the cavity helps accelerate particle beams, which travel down the cavity’s axis. For the last several years, researchers have been developing cavities made of pure niobium for the next generation of particle accelerators. Scientist Alexander Romanenko, TD, also recently achieved a record measurement on a standard pure-niobium cavity. By putting the cavity through a particular polishing and baking regimen, he achieved a lower surface resistance at 1.6 K than previously observed. This lower resistance helps increase the cavities’ Q. Researchers are developing machines that run continuous-wave beams, as contrasted with pulsed beams, for future accelerators such as Berkeley Laboratory’s Next-Generation Light Source and Fermilab’s proposed Project X. CW accelerators require a good deal of power. With increased Q, cavities use less power and therefore require less refrigeration, helping save financial resources. 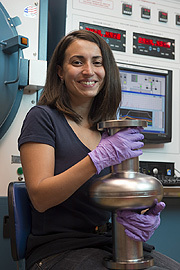 While pure niobium continues to be a promising material for superconducting cavities, Grassellino wanted to see what she could do with a new, different superconductor, so she worked with Allan Rowe and Mayling Wong-Squires of the SRF processing group. Together, they succeeded in producing a cavity with the new Q. Though researchers were previously able to achieve intriguing results above 4.2 Kelvin, they seemed to hit a wall when the temperature dropped below 4.2 K. The new Fermilab measurement shows instead almost zero surface resistance as the temperature approaches 1.6 K.
“Anna’s got impressive first results. It’s a great first step toward technology achievements for CW projects around the globe,” said SRF Development Department Head Slava Yakovlev, who initiated the Q-maximization program.